This is the story of Parsottambhai, whose life changed through Nirman, a programme of Saath. Nirman addresses the training needs of people in the informal job sector. Parsottam Chelabhai Parmar residing in Beehrampura, Ahmedabad comes from a family of seven. He used to work as a guard, in the night shift for an security agency. He received a pay of Rs.6,000 per month, however he was not able to meet his expenses with his income. He always had a keen interest to become an electrician however he could not afford the formal training programme. Parsottambhai came to know about Nirman programme through a friend who had visited the Nirman center running in their area. He says “I saw a ray of hope for me, when I heard about Nirman. I enrolled my name for the Electrical Training Batch at the Behrampura center. Initially I had my doubts about the facilities that would be provided at the center as they charged a very meager fee, but I decided to join the programme. The timing of the session was completely appropriate for me and I did not have to miss out on my regular job. When I attended my first session all my doubts about the working of the programme were cleared. The trainers gave me formal training in plate earthing, wiring,importance of personal safety. The theory sessions were accompanied with its practical applications. Also, additional sessions were organised covering topics such as lifeskills, insurance, importance of savings etc., which proved to be really helpful ”. On the completion of the course Parsottambhai received a certificate and a tool kit from the center. Due to the certificate Parsottambhai was able to get a job at the Torrent plant. He now earns Rs. 10,000 a month and his standard of living has improved. “SAATH’s Nirman programme helped me a lot. This has been only possible because of the skills that I have received through this course. I am thankful to Saath for the same”, says Parsottambhai. 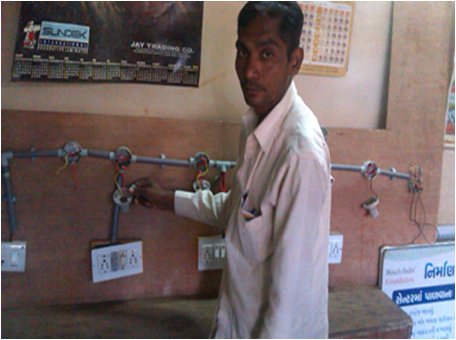 This entry was posted in Community Channel, Daily Dose of Saath and tagged Case story, case-study, Electrician training, Informal Sector, Nirman. Bookmark the permalink.